History was made as Croatian and Real Madrid midfield wizard Luka Modric won the Ballond’Or award for the first time. This will be the first time in over a decade that someone else has claimed the prestigious award other than Lionel Messi or Cristiano Ronaldo, and with this award, Luka Modric is officially the best footballer in the world. The award has become a yearly affair after it was first given out 1956 by French Football Magazine to the best player of that year as selected by a panel of football journalists. Juventus and Portugal hit man Ronaldo, who has won the past two awards, finished in second place while Atletico Madrid and France striker Antoine Griezmann was third. Messi could not make it to the podium this time around for the first time since 2006, his absence on the podium this year might be largely due to Argentina’s abysmal performance at the World Cup. However, Messi was a part of the 30-man shortlist for the award that also included Manchester City’s Sergio Aguero, Liverpool’s forward, Mo Salah and Manchester United and France midfielder Paul Pogba. 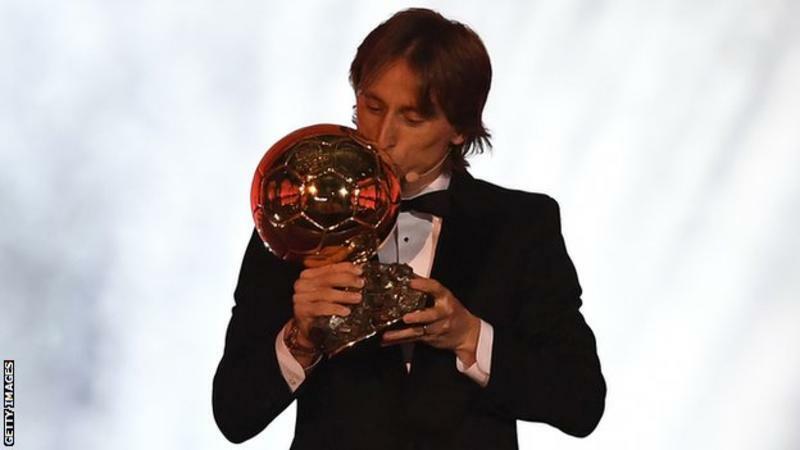 Luka Modric, 33, becomes the first Croatian to win the award after fellow countryman and then Real striker Davor Suker finished as runner-up in 1998. Luka Modric had a great year a great year for club and country as he helped Los Blancos claim a third straight Champions League title in a 3-1 success over Liverpool in May. Modric was exceptional in the Champions League final as he won 100 per cent of his tackles without committing a foul and posted a 94-per-cent accuracy rate with his passing. Modric was also instrumental to the success of Croatia at June’s World Cup in which he helped them reach the Final for the first time but Croatia eventually lost 4-2 to eventual winners France. Modric claimed the Golden Ball as the most valuable player at the World Cup tournament, averaging 69 passes per match and accumulating the most minutes at the tourney by any player. The inaugural women’s award was also handed out on Monday with Ada Hegerberg of Olympique Lyonnais claiming the honour. ← Why Choose All Nigeria Football Sure Prediction?